Removes heavy oxidation and deep scratches from your boat's finish! Marine 31 Gel Coat Heavy-Cut Oxidation Cleaner is the first step in restoring neglected marine gel coat. Marine 31 Gel Coat Heavy-Cut Oxidation Remover quickly cuts through deep oxidation and removes hull scuffs and scratches from all gel coat surfaces. Proprietary diminishing abrasives work quickly, while Marine 31's advanced lubricant system provides a long buffing cycle and minimal dusting, even in the Florida sun. Marine 31 Gel Coat Heavy-Cut Oxidation Cleaner delivers exceptional performance for users of all skill levels. This advanced gel coat compound can be used by a rotary polisher or a dual-action polisher with outstanding results. Advanced diminishing abrasives restore years of neglect by quickly eliminating oxidation and dead gel coat. You will quickly see the results of aging disappear in front of you. 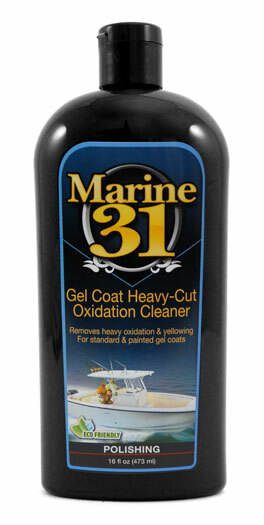 Marine 31 Gel Coat Heavy-Cut Oxidation Cleaner is easy-to-use. Because it was formulated in south Florida, it had to be sun friendly, have a long buffing cycle, and wipe away with ease. Marine 31 is dedicated to persevering the intricate ecology of our world's marine life, so Heavy-Cut Oxidation Cleaner is environmentally friendly and harbor-safe. A Tip From The Captain�s Chair: Make sure to clean your polishing pad frequently for best results. Follow up polishing with Marine 31 Gel Coat Gloss & Color Restorer.